A couple of weeks back I joined the Altos Tequila team at Feastival on a very stormy Cape Town night to learn more about the brand while also gaining some new cocktail-making skills. 1 bottle of Altos tequila takes an average of 9 years to make. This comes down to harvesting of the agave plant itself which happens between 6-8 years. Tequila has a controlled Appellation Of Origin. This means that tequila is only allowed to be produced in Mexico (and in specific 5 states of Mexico: Nayarit, Tamaulipas, Jalisco, Guanajuato, Michoacan). There are 5 categories of tequila -Blanco, Gold, Reposado, Anejo, Extra Anejo. South Africans often confuse a Reposado tequila for a gold tequila, but gold tequila is a silver tequila with coloring and flavors added. A reposado tequila is the entry level aged tequila which is aged for between 2 & 12 months. A blanco tequila is the purest form of tequila available, as one is not allowed to add anything to it according to Mexican law. As soon as one gets to the other categories (gold, reposado, anejo, extra anejo) you are allowed to add 1% or less of final product in additives. Consuming tequila with lime and salt is a Western practice, and is not actually done in Mexico. In Mexico they choose to sip it slowly or they enjoy it in a long drink or cocktail. 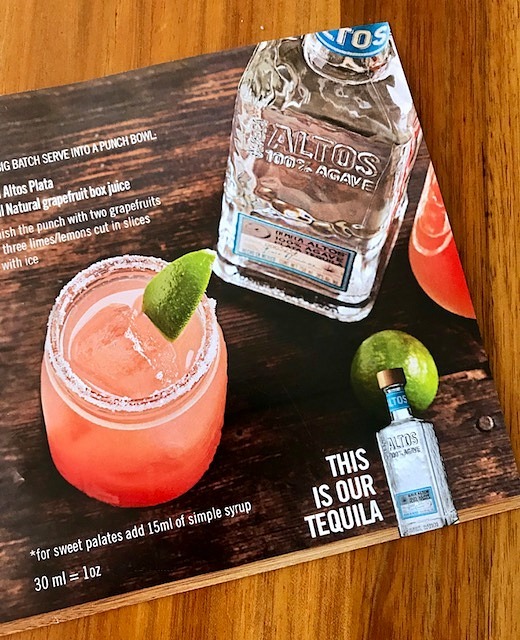 The Altos team has been awesome enough to share their recipe for a Paloma so you can impress at your next party or dinner at home. Build in a highball glass, no ice, stir to dissolve the salt and then add ice. Lastly, squeeze the 2 wedges of lime. If you like, frost the glass with natural crushed salt and garnish with another lime wedge. So there you have it. Hopefully your tequila repertoire has now been extended beyond the good ol’ throw-it-back shooter. I dunno about you guys, but I’m definitely ready for summer to arrive now so I can host a Paloma party of my own. Wait a minute, did HQ say bottomless bubbly? ?